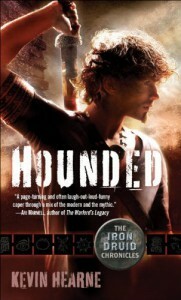 If you are looking for something fun to listen to on audio, Hounded is a great choice. Luke Daniels's voice is really age and style appropriate although Atticus's dog Oberon does sound too much like Cheech Marin to me.I laughed out loud so many times listening to Hounded. I don't do that very often, much less multiple times in the same book.I'm certain the book is just as fun in print as it is in audio, but I like finding audiobooks that have this level of entertainment in them.The Iron Druid Chronicles is an urban fantasy series. Many (many) mythical creatures make an appearance in Hounded, but they all have their place. I kind of tiptoe through the urban fantasy genre every once in a while, and I've really enjoyed every UF book that I've given a try so far.I will definitely continue on with this series, and I will likely listen to them all on audio as well.